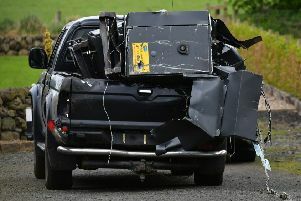 A 25-year-old man has been arrested in connection with what police describe as 'organised criminality' in the Mid and East Antrim area. Speaking after the arrest was made in Belfast on Friday, PSNI’s Criminal Investigation Branch Detective Inspector Chris Millar said: “Police seized a substantial amount of firearms and ammunition as well as a quantity of Class A drugs following searches in the Ballymena area yesterday. “The search and arrest operation has removed a substantial number of firearms and ammunition from the streets which again demonstrates our ongoing commitment to keep people safe by removing anything which can harm our communities. “I have no doubt that lives have been saved as these weapons can only inflict serious damage either through death or horrific injuries.